From Derbyshire to Davos - is the Chancellor out of touch with British SMEs? From Derbyshire to Davos – is the Chancellor out of touch with British SMEs? 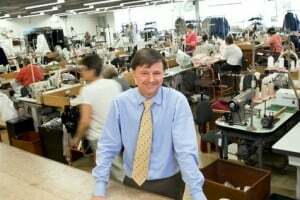 Following a national television news interview with Channel 4’s Nick Scott Plummer, regarding the latest Gross Domestic Profit (GDP) figures from the Office of National Statistics, Christopher Nieper, Managing Director of luxury ladies clothing firm David Nieper has asked if the Chancellor is completely ‘out of touch’ with British SMEs. The Channel 4 news programme filmed from the fashion studios at David Nieper in Derbyshire where the company has had the most successful year in its 55 year history. Its performance was attributed to a more competitive pound boosting exports, and an increased consumer appetite for British Made goods. The GDP figures showed a 0.5% increase in the UK’s service industry in the last quarter, but a much more significant 1.3% increase in the manufacturing sector. Export orderbooks are at a 30 year high and unemployment is at a 30 year low. Christopher Nieper, Managing Director of the clothing firm painted an upbeat and positive picture of what is happening at the coalface of British manufacturing, including a surge in sales, increased productivity and more jobs. However, this interview when aired on Channel 4’s news programme appeared in stark contrast to the Chancellor, Phillip Hammond’s comments from Davos. A world away from British manufacturing, in the luxury Swiss ski resort, the Chancellor spoke from the World Economic Forum in the company of the world’s political elite, and set a much more gloomy tone for British business, promoting a climate of economic uncertainty. The Chancellor talked about an uncertain future, business decisions being postponed and investment being put on hold, until the government provide greater clarity on the future relationship with the European Union. “Uncertainty, what uncertainty? Is the Chancellor out of touch with SMEs who make up 99 percent of British companies? Growth comes from being competitive in a global market and the key to recovering Britain’s deficit and eliminating austerity is through productivity. Making things is back in fashion and Brand Britain is sought after the world over. Please Chancellor, don’t talk the economy down when it’s growing all around you.